Thanksgiving is over and family members no longer have to be civil. It’s officially time for a trip to Williams-Brice, a stadium Clemson has owned for over 108 years. And, it’s time for the Tigers and 10,000 orange clad faithful to make the 100 mile trek down I-385 and Interstate 26 to collect the rent and two years of past-due fees. 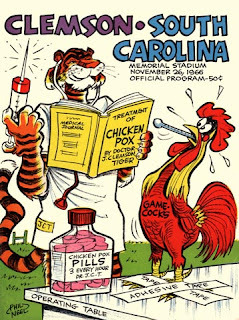 Let’s take a look at the Clemson vs South Carolina matchup. Let’s face it, USC isn’t really known for their electric passing game or great wide receivers. Quarterback Connor Shaw has completed 98-of-151 passes for 1,008 yards, nine touchdowns and six interceptions. Shaw has found one-time superstar Alshon Jeffery 43 times for 585 yards. After a magnificent season a year ago, Jeffrey was dubbed as a first round draft pick, but he has played lazy, uninspired, and lackadaisical so far this season. Clemson’s speedster cornerback Coty Sensabaugh will probably be tasked with keeping Jeffrey off the statistical charts. The heart and soul of the Gamecock offense is the ground attack. Steve Spurrier, although known for a fun-and-gun style offense has played to the strengths of his offense. Shaw will run a zone read most of the day giving him the option to hand it off to running back Brandon Wilds or keep it and run up field based on the actions of the defensive end. As good as everyone in the country makes the South Carolina defensive line out to be, they have only played TWO true passing teams - Georgia and Arkansas and both teams threw for 248 yards and 299 yards, respectively. With the return of left tackle Phillip Price, the Clemson offensive line should be well-equipped to handle the pass rush coming from the Gamecocks defensive line. Melvin Ingram and Jadeveon Clowney have accounted for 11 of South Carolina’s 20 sacks this season. To keep that in perspective, Clemson’s defensive line that has been heavily criticized also has 20 sacks on the year. Tajh Boyd is the key to the passing game. The last three games, he has tried to force throws into tight windows, throwing into double and triple coverage when there are other wide open guys with lots of room to run. Boyd cannot continue to key in on one or two players and remember his checkdown receivers. Clemson’s running game has struggled as of late averaging less than 100 yards per game. The last great game the Tigers had on the ground was against Maryland when Andre Ellington rushed for over 200 yards. Since then, they have been largely ineffective although one game was without starter Andre Ellington. Ellington has rushed for 871 yards and nine touchdowns. The Clemson special teams has been less than spectacular the last two weeks giving up two long punt returns and one for a touchdown. Punter Dawson Zimmerman is averaging 42.6 yards per punt. Kicker Chandler Catanzaro is 17-for-22 on the season including a huge game-winning field goal to clinch the ACC Atlantic against Wake Forest. South Carolina holds momentum in the series over the last two seasons winning in blowout fashion both times. Logic and national pundits say the Tigers don’t have a chance against a stingy Gamecock defense. You can throw out all of the season statistics, all of the wins and losses, and everything associated with what has happened in the previous 11 games. This is Clemson vs South Carolina. This is the Palmetto State Showdown. This is for bragging rights. Forget what the national media and what Las Vegas (USC is a four point favorite) predicts, it’s time for the Tigers to collect the rent on what they have owned with a record of 65-39-4.